← Does iterating through SPList.Items using foreach affect performance? Today a colleague wanted to export this list to Excel to facilitate some testing. The problem is the page that comes up when you click Settings\View Group Permissions is a dialog and you can’t right click on it, or even select and copy/paste. Get the group ID. The URL when viewing a group is of the format http://yourServer/_layouts/people.aspx?MembershipGroupId=25. 25 is the group ID. Browse to this page http://yourServer/_layouts/viewgrouppermissions.aspx?ID=25, and change the ID to the ID of the group you want to view. On the page that comes up, right click on the table and choose Export to Microsoft Excel (or whatever else you fancy). Is there any way to achieve this through C# code, so getting the list of permissions through code ? There is, but you will need to loop through all the webs in the site collection, and all the sub webs and lists. The main classes you will be working with include SPRoleAssignment, SPRoleDefinition and SPPrincipal (parent class of SPUser and SPGroup). All securable objects in SharePoint (i.e list, list item, web) have a RoleAssignments property, which is a collection of SPRoleAssignment objects. This property will be your starting point. All securable objects also have a HasUniqueRoleAssignments property – which determines if the object is inheriting permissions from its parent. the post looks quite old, but I have a similar question. 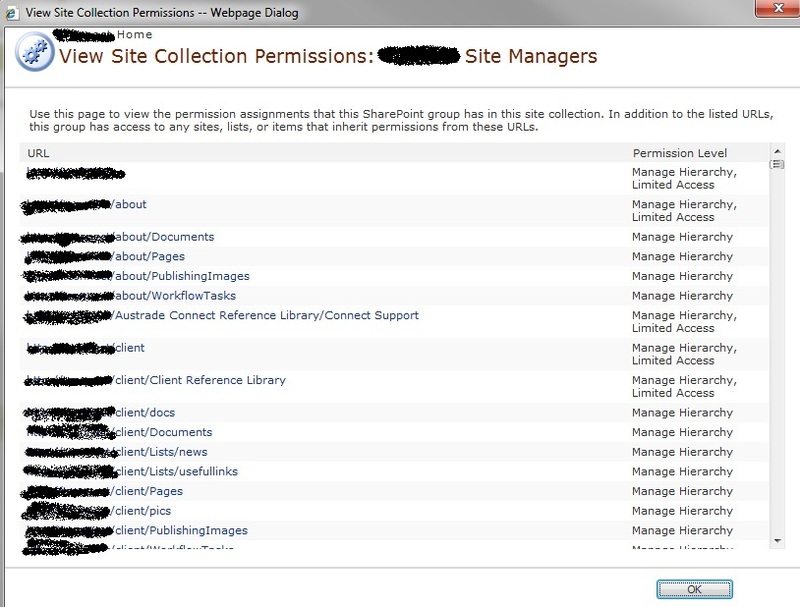 Is there a way to find out all the folders in Sharepoint and members and their permissions. what are highlevel steps? 2. Go to Settings/Site Settings/People and Groups/ and choose any group. 5. Go back to Settings/Site Settings/People and Groups/ and choose the group you want to export. 6. At the right end of the toolbar for the group membership, change the view selector to select your custom view. 7. Use Ctrl/A to select the entire page, then Ctrl/C to copy it. 8. Open an empty text file using Notepad and paste the contents of the page into it. 9. The copy operation will leave you at the bottom of the text file. Delete all the text below the last account. 10. Go to the top of the text file and delete all the text above the first account.